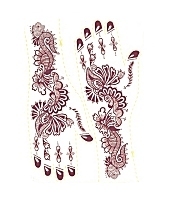 Palm Tattoos also known as Henna Tattoo is an ancient Indian Body Art. 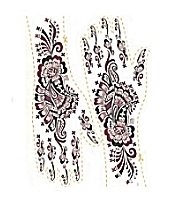 It is used to create intricate ethnic or contemporary designs and exotic patterns on various parts of the body, though traditionally it was applied to the hands and feet of ladies preparing for special auspicious ceremonies. 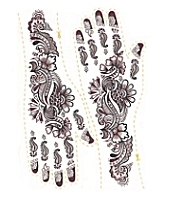 Henna tattoo became a fashion rage when Celebrities like Madonna and Demi Moore started sporting it in the late 1980. It was an ancient body art form that started from the Middle East Asian countries and evolved to today’s modern genre for artistic expression. The application of palm tattoo is non-permanent, painless and without any side-effects. 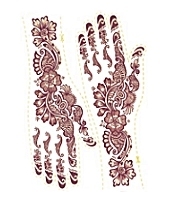 Our beautifully designed transferable body tattoos, made from safe to use, easy substitute to the traditional henna applied by Indian brides.